OTC, or the Offshore Technology Conference, is one of the top networking events for energy professionals in the world. Here, companies and individuals can meet to share knowledge, ideas, and opinions on the latest offshore technology and resources. OTC has recently expanded both globally and technically to partner with OTC Brazil, OTC Asia, and the Arctic Technology Conference. OTC receives sponsorship from more than 13 societies and organizations within the industry, which work together to create and develop a strong technical program for each conference. TuiSpace helps you impress your clients, prospects and makes you stand out from the competition. Each year, Houston has the honor of hosting the Offshore Technology Conference, allowing local and international business owners to effectively extend outreach to new clients. You can make a powerful impression on new prospects and clients, as well as save money by using TuiSpace’s professional designs and print materials. 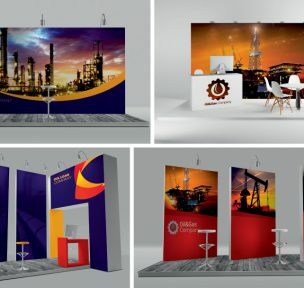 For the most affordable, fast, professional graphic design and print services for oil and gas companies, TuiSpace delivers. No matter what type of marketing materials you need, TuiSpace can create a consistent brand image for each type of material you order. Our solutions help you create an entire collection of collateral for your marketing ventures, including website designs that are integrated with your trade show graphics and displays for consistent branding. The idea behind our consistent logo and brand design is to coordinate a theme that resonates strongly with your audience, making your theme stand out in their mind. You’ll receive professionally-designed flyers, postcards, and brochures, all using the same artwork you’ve selected for your trade show graphics. This allows prospects to easily recognize you. The attention-getting graphics we provide drive new visitors to your display at OTC, resulting in more prospects every time. The matching website we create for you will reinforce your marketing message, directing prospects to your site. This makes the process of lead capture and tracking simple, so you can plot the course of your target’s first visit to the final sale. When you’re getting ready for the trade show, make sure you bring plenty of marketing materials. You will need brochures, giveaways, business cards, and other important literature for your brand. Be sure to calculate how many attendees will realistically be attending your booth — and bring at least that many copies of your material, or a few extras to be on the safe side. Additionally, be sure you generate plenty of enthusiasm among the employees and staff who will be representing your company. They should be aware of company trends, products, services, and competitors, eager to carry on conversations with prospective clients and customers. Your staff should be encouraged to engage with and interact with attendees, gathering as much contact information as possible, as well as visiting competitor booths and utilizing the leads qualification survey. TuiSpace can print all your needed materials at wholesale prices. It’s critical to create effective exhibit design before you take your spot at OTC. Customers will be bombarded by numerous marketing messages, and you want to make sure your message truly stands out. Each design project we undertake goes through a detailed, thorough process. We begin with the “Discover” phase. At this point, we meet with you and your team, outlining your needs, goals, and special parameters. Then, we move to the “Evaluate” phase. At this stage, we examine your past efforts and key players in your marketing field. After that, we explore future options of how to improve. Then we move on to the “Design” phase, iterating until we have polished the final product to your satisfaction. According to your recommendations, we’ll “Adjust.” Finally, we “Execute” your design in a professional, powerful manner. To maximize on your success, TuiSpace brings designers into each stage of our development process for your exhibit. Larger projects utilize our special detailers and engineering team. This way, we can maximize the effectiveness and impact of your exhibit. For any exhibit to be successful, it’s critical to determine how your booth is going to be used — both by customers and by staff. This is a key initial step. TuiSpace will work one on one with you to determine the best layout option for your exhibit, and then refine through a number of iterations until your ideal final layout comes to life. Tradeshows only allow for a few seconds to capture your prospect’s interest. The talented graphic design team at TuiSpace knows what makes a critical impact on customers — what truly gets their attention. We’ll use this information to ensure your exhibit’s graphic design is maximized. It’s vital to keep a consistent feel and look for each of your marketing materials to create a thorough, solid brand design. TuiSpace employs extremely professional, well-trained experts who understand that your exhibit’s design must be fully integrated with brand identity to create a seamless marketing experience for your prospects. Your customers should have a specific goal or theme to see first, next, and last. You’ll want to have a plan, or a trail, to lead them along; deciding where to lead them along each step of the way. This way, you can determine where product features and specs should be shown on your materials. Utilizing a special process known as “hierarchy of messaging,” we determine how best to display information to your customers so they find the key information you want to get in front of their eyes. It’s easy to put up a large LCD screen on an exhibit, but at TuiSpace, we’ll make sure all your media and technology are incorporated in an intelligent, streamlined way. Utilizing touchscreens, presentation displays, LED Walls and other key technological implementation methods, we’ll turn your booth into a fully interactive, hands-on experience for anyone who comes in. One understated part of this process is lighting. Lighting plays a critical role in the personality, design, and functionality of your overall exhibit — the whole product. We will integrated creative LED lighting at appropriate sections of the layout, ensuring minimal energy and heat consumption while still maximizing programmability, space saving, and light concentration. If you’re setting up a display at OTC this year, you may be investing more than $2500 just for entry fees. Add on costs for generating leads and sales, making professional contacts, and gaining new media exposure; you may be looking at a significant investment. Fortunately, surveys have shown that 75% or more of marketing at in-person tradeshows and events, helps in having the largest payoff for small to medium-businesses, as well as larger enterprises. Developing a marketing plan is critical. Be sure you outline what you want to get out of any convention or tradeshow you attend — including OTC. You’ll need to develop your marketing video and pictures; craft a powerful pitch for new investors and clients; and use social media in such a way that you can obtain new followers and improve your profile. Use as many newsletter opportunities and business outreach methods to gain new leads, improving your overall ROI. It helps to know your target audience inside and out. This is the best way of obtaining a high ROI, so that you can leverage your position in the marketplace as much as possible. In fact, the ROI value of a strong media presence at tradeshows like OTC has been estimated to be 6-1. So, if you invest $1000 for one ad, you’ll gain $6000 worth of new leads and prospects. These are just a few methods for getting the most out of your time at OTC. Try out our tips and tricks at the convention this year and see if you gain new social media and face-to-face leads just by extending outreach. To obtain maximum press and ROI from OTC, TuiSpace provides affordable, fast, professional graphic design and print services for oil and gas companies in Houston. We are ready to help you develop a powerful media presence.